"Sampath Speaking" - the thoughts of an Insurer from Thiruvallikkeni: Income Tax Dept hands over medals ! in US, even Olympic medals are taxable !! Income Tax Dept hands over medals ! in US, even Olympic medals are taxable !! # Nothing is certain but death and taxes # ~ an oft repeated fatalistic and sardonic proverb. It draws on the actual inevitability of death to highlight the difficulty in avoiding the burden of taxes. Though this is attributed to many – Benjamin Franklin is widely believed to have authored the present form. After the great Independent uprising [Mutiny of 1857], British Govt faced acute financial crisis. To fill up the treasury, the first Income-tax Act was introduced in February, 1860 by James Wilson, who became British-India's first Finance Minister. Income was classified as under - income from: landed property; professions and trade; from securities, annuities and dividends; and from salaries and pensions. Later Agricultural income too was subjected to tax. After Independence, a new enactment titled `Income-tax Act, 1961' came into being. Taxation falls in the realm of public finance, the most rapidly developing branch of economic theory. The basic objective of taxation is to raise money needed to finance government expenditure. But taxes have other effects too. As a factor affecting the pricing of goods, they determine what to produce and in what measure. By taxing the affluent sections of society more, they change the distribution of incomes and wealth. There is always a feeling that salaried people by force contribute to tax more than some professional earners, who hide their salary and do not pay tax fully ! For the middle income group of salaried tax payers, month of March has been menacing with higher cut in salary to Income tax (primarily because it was not well planned or failure to comply with the tax based savings commitment) – over the years, the Income tax department has come to acquire an image of an agency that usually harasses taxpayers, including the honest ones. That image is changing ! – now many of us file Tax returns Online and get refunds within days of filing ~ and to add more, in the last few days several individuals are surprised to receive a 'Certificate of Appreciation' in their mailbox, with some even mistaking it for a spam mail. Yes it is an Appreciatory Certificate – issued by Ministry of Finance, Central Board of Direct Taxes – that of the Government acknowledging the contribution of individual tax payers in paying taxes within the prescribed time and prompt filing of Income Tax Returns. Recently, the Honourable Finance Minister, Shri Arun Jaitley handed over certificates of appreciation issued by CBDT honoring select tax payers for such contribution. This step marks the first effort by the Government to directly communicate to the tax payer its appreciation for that contribution. 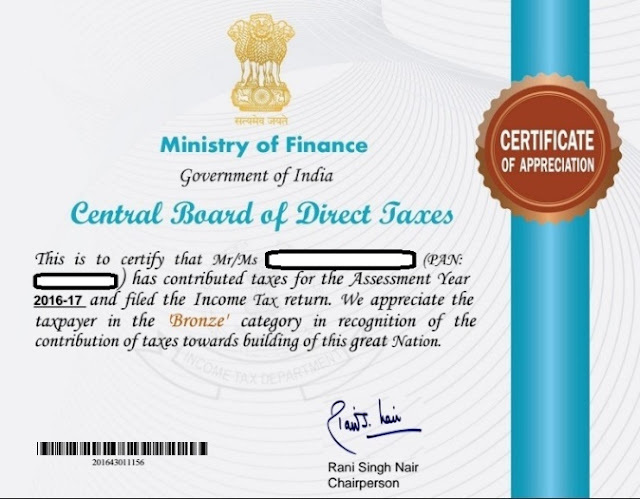 CBDT has started sending out certificates of appreciation to individual tax payers by e-mail in various categories on the basis of the level of taxes paid by them for the current Assessment Year 2016-17 where taxes have been paid in full and tax payers have no outstanding tax liabilities and where the return is e-filed within the prescribed due date. The tax payers may display these certificates in their homes / offices. The categories for individual taxpayers and the number of certificates being issued in the first round are: i. Platinum : Tax contributed Rs. 1 Crore and above ii. Gold : Tax contributed Rs. 50Lakh to Rs. 1 Crore iii. Silver : Tax contributed Rs. 10Lakh to Rs.50 Lakh iv. Bronze : Tax contributed Rs. 1Lakh to Rs.10 Lakh The CBDT urges taxpayers to e-file their returns in time and verify their return by submitting the Electronic Verification Code online or sending their ITR-V within the 120 day period so that they can be also acknowledged for their contribution. On the subject of personal taxes – do you ever feel, burdened, having done something great yet ended up paying taxes, read more ! She has flipped, tumbled and leapt her way into the hearts of millions over the course of the Rio Olympic games, but when Simone Biles returned home, she was not only part of celebrations but also had to pay hefty tax !! The 19-year-old won five Olympic medals - four gold and one bronze. She cemented her title as the world's best gymnast by taking home the gold in the all-around after three successive world championship titles - a feat only accomplished by three others in history. However, the Winning did cost her. She reportedly had a tax bill close to $43,560 (Rs.29 lakhs approx) – that is an estimated tax liability based on the reported $2m that she accumulated in endorsement deals and assuming she is charged in the highest income tax bracket in the US - 39.6%. Biles is not alone, her fellow US medallists too were slapped with tax bills for their victories as well. American Olympians are subject to a so-called "victory tax" - a tax on both the money they receive from the Olympic committee for winning and on the value of the Olympic medal. US athletes who won a medal at the Rio games took with them the hardware and a cash bonus from the US Olympic Committee. Gold medallists received $25,000, silver medallists got $15,000, and bronze winners $10,000. Those winnings are taxed as income, the same way Americans are taxed on other prize money, like lottery winnings. It is not money and endorsements, but medals too – medals are also given a value and taxed. The value is based on the value of the materials the medals are made of. Gold medals - which are mostly made of silver with a gold plating - are worth roughly $600 based on current commodity prices, silver medals are worth close to $300, bronze medals - which consist mostly of copper - have barely any monetary value, approximately $4. For US athletes like Michael Phelps and Simone Biles, who secured multiple victories, including multiple gold medals that bill perhaps was much higher. Very sad that olympians are heftily taxed in US. Thanks for the informative write up.